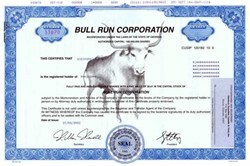 Beautifully engraved certificate from the Bull Run Corporation. This historic document has an ornate border around it with a underprint of a bull. This item has the printed signatures of the Company’s President and Secretary. Bull Run Corporation, based in Atlanta, is a sports, events, lifestyle and affinity marketing company through its centerpiece subsidiary, Host Communications, Inc. HOST is a multi-faceted corporation, with more than 400 employees in 22 U.S. offices and an international division in Paris, France. HOST was acquired by Bull Run in December 1999 and is most widely recognized for its long-standing relationship with the National Collegiate Athletic Association® (NCAA®). The HOST-NCAA partnership, dating back to 1975, continues to be the longest-consecutive association between the NCAA and any other contractor. In addition to its NCAA business, HOST’s other core areas are Association Management, Collegiate Sports Marketing, Creative Services, Participatory Event Marketing (including the NBA Hoop-It-Up 3-on-3 basketball tour), Printing & Publishing, Radio and Television. The Company, with its extensive capabilities, provides comprehensive sales, marketing, multimedia, special event and convention and hospitality services to domestic and international grassroots participatory events, high-profile colleges, universities and athletic conferences, national associations - many of which having a global presence - and to a wide range of sports ventures including basketball and soccer. Bull Run also holds significant investments in Gray Communications Systems, Inc., an owner and operator of 13 television stations and four newspapers; Rawlings Sporting Goods Company, Inc., a leading supplier of team sports equipment in North America; iHigh, Inc., a unique Internet and marketing company focused on high school students; and Sarkes Tarzian Inc., an owner and operator of two television stations and four radio stations.